Explore the numerous day-trip ideas around Mexico City: San Juan Teotihuacan (Pyramid of the Sun & Zona Arqueologica Teotihuacan). There's still lots to do: examine the collection at National Museum of Anthropology (Museo Nacional de Antropologia), explore the ancient world of Templo Mayor Museum, steep yourself in history at Chapultepec Castle, and wander the streets of Historic Center (Centro Historico). 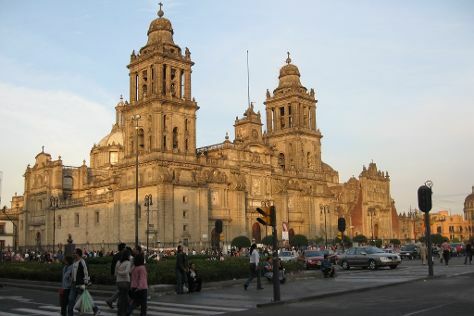 For maps, reviews, and tourist information, read our Mexico City vacation builder. If you are flying in from Mexico, the closest major airports are Licenciado Benito Juarez International Airport, Querétaro Intercontinental Airport and General Francisco J. Mujica International Airport. In June, plan for daily highs up to 28°C, and evening lows to 16°C. Wrap up your sightseeing on the 23rd (Sat) to allow time to travel to Madrid. Take a break from Madrid with a short trip to Catedral Primada in Toledo, about 1h 30 min away. There's much more to do: see the interesting displays at Museo Nacional del Prado, hunt for treasures at Mercado San Miguel, make a trip to Puerta del Sol, and admire the masterpieces at Museum Sorolla. To see photos, maps, where to stay, and other tourist information, read Madrid trip generator. Traveling by flight from Mexico City to Madrid takes 14.5 hours. The time zone difference moving from Central Standard Time (CST) to Central European Time (CET) is 7 hours. While traveling from Mexico City, expect somewhat warmer days and about the same nights in Madrid, ranging from highs of 36°C to lows of 19°C. Wrap up your sightseeing on the 27th (Wed) to allow time to travel back home.